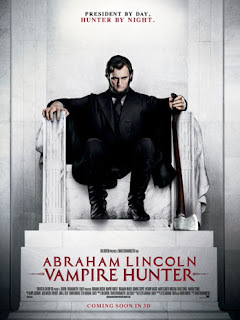 NOVEL CHATTER: Abraham Lincoln: Vampire Hunter - We have a poster! Abraham Lincoln: Vampire Hunter - We have a poster! WOO HOO! Here's the poster for Abraham Lincoln: Vampire Hunter, from HollywoodReporter.com. The movie of course is based on Seth Grahame-Smith's novel, it's adapted for the screen by Simon Kinberg and Seth Grahame-Smith, and is directed by Timur Bekmambetov.